Growing up in the Northeast, the figure of the tough Boston “Southie” loomed large, although New York City was closer in influence and distance. The accent, the crassness, the hotheaded willingness to fight over everything, were always intimidating, even if that culture gave us The New Kids on the Block and Marky Mark. 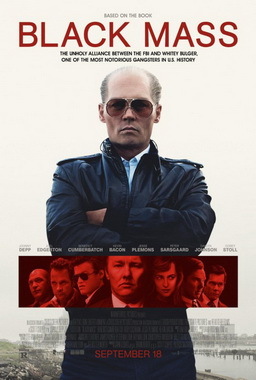 I had never heard of Whitey Bulger or his crimes until I previewed Black Mass (based on the book Black Mass: Whitey Bulger, The FBI and a Devil’s Deal) this weekend at the Telluride Film Festival. I can’t do a recap or full critique, but I can tell you that it’s excellent, and bloody brutal. Performances to watch here include Benedict Cumberbatch as Whitey’s brother, former state senator Billy Bulger and Joel Edgerton as Whitey’s childhood friend and corrupt FBI agent John Connolly. A lot has been written about how Whitey Bulger was “beloved” in South Boston, and is looked upon as a homegrown hero/”one of our own”. I don’t think the film overstated or focused on this point. The graphic violence and frightening sociopathy demonstrated in the film is enough to balance the scenes of Whitey taking care of his mother, tucking his son into bed or helping the nice old lady from the neighborhood with her groceries. Yet, Whitey was played by the extremely talented and Byronic Johnny Depp, and so, even with the jacked-up teeth and horrid hair that were part of the makeup job, you can still find yourself fascinated by the character. And perhaps a small dark corner of your mind allows you to root for him, or admire his dark kingly gangster ways, just as you might Count Dracula. I’m calling Depp’s Oscar win now for this one.